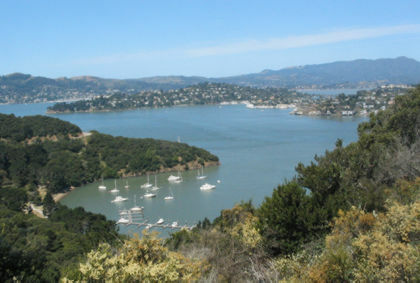 Angel Island is this hunk of rock poking up out of the middle of San Francisco Bay. 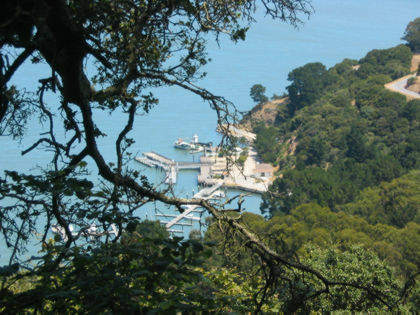 The island’s a state park now, but over the years it’s been home to an anti-aircraft missile base, a prisoner of war camp and a processing/quarantine station for overseas immigrants. 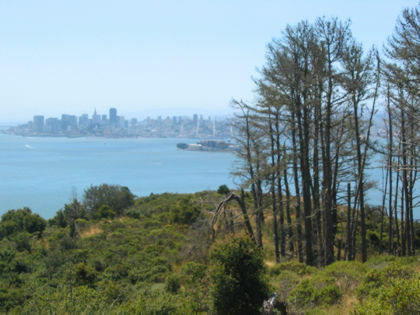 The old quarantine station is becoming a major tourist attraction — sort of a West Coast Ellis Island — but I came for the hiking trails, which wind their way to the top of Mount Livermore, elevation 788 feet. The view from the top looks out over the entire San Francisco Bay, an amazing sight on a clear day. And clear it was — a gift from the weather deities, who delight in shrouding the Bay in fog and chilling us with Pacific breezes. 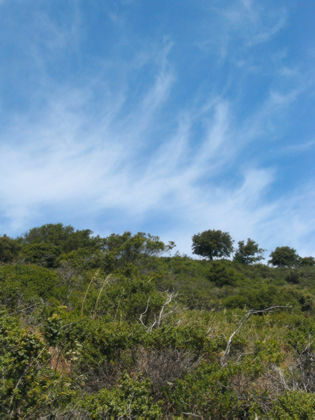 On Sunday the wind was mild, the temperature seasonable, the sky blue to the horizon in all directions. 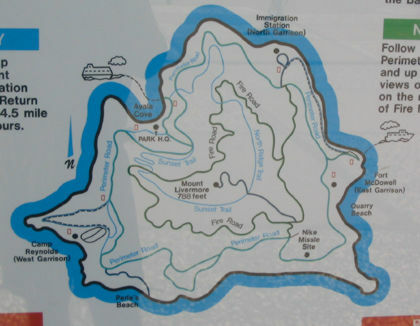 The only way to get to the island is by boat. Poor folks either row over in kayaks or take ferries. 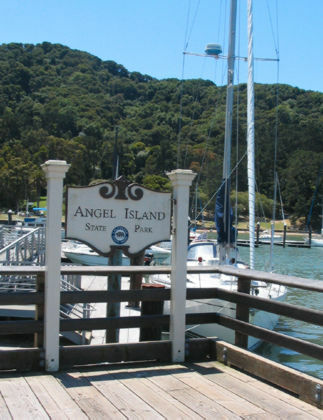 I took the Angel Island Ferry in Tiburon, which leaves every hour on the weekends. 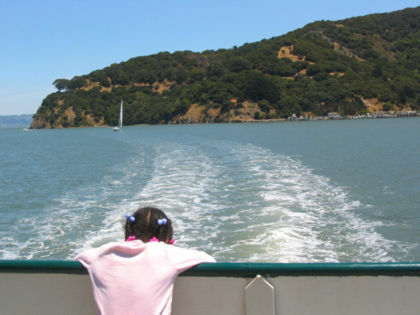 Roundtrip tickets are $10, which is also what it costs to park all day Tiburon’s city lot. So bring a $20 if you plan to come this way. 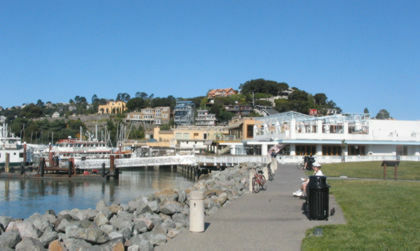 Tiburon’s a quaint little town where the average home sells for, oh, about $10 million, I suppose. 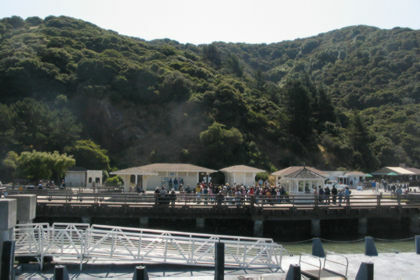 Folks wait to board the ferry. That’s Angel Island across the water. 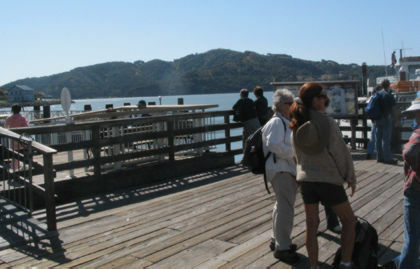 Tiburon’s really the best place to ferry from, because it’s the shortest (and cheapest) boat ride. Otherwise you have to come over from San Francisco, which can be a very chilly voyage. We’re off. Alcatraz, just to the right, and San Francisco behind the Rock. Foreign tourists admiring the view. That’s Mount Tamalpais in the background. Arriving at the park, where a large tour group has already gathered. Lots of places for folks to moor their boats, though why anybody’d have their boat moored on a day like this is beyond me. 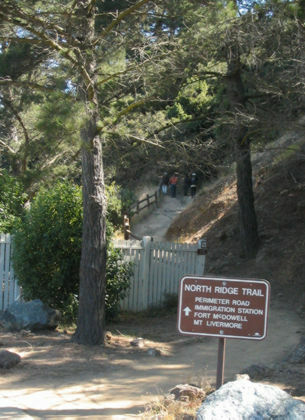 I took the North Ridge Trail to Mount Livermore, then came back down on the Sunset Trail. It’s about a 4.5-mile loop. It’s steep from the trailhead, but levels off a bit after the first quarter mile or so. 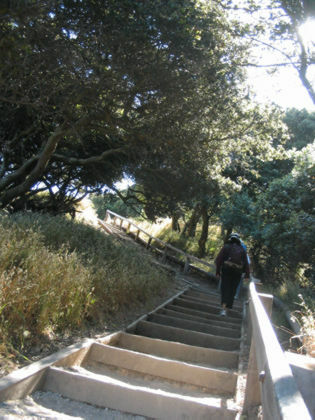 A set of steps gets the ol’ heart pumping. The first 20 minutes of the hike are tree-covered and shady, but near the top the forest thins out and the spectacular views of the surrounding countryside start to open up. The trail’s crest — took me about an hour to hike up there. Old fences — just what my Canon craves. 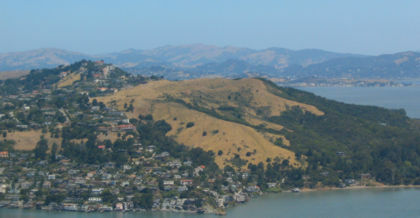 OK, here’s one of the views from the top of Mount Livermore. Tiburon and points beyond look a lot better from up here. Heading back down on the Sunset Trail. That’s the old quarantine/immigration station. 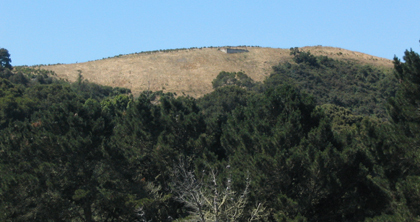 I took a bunch of pictures showing San Francisco looming behind the trees. This one’s roughly representative. Looks like somebody airbrushed these clouds onto that blue-sky canvas. 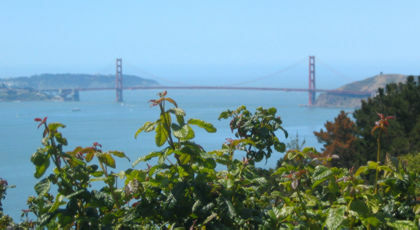 Angel Island seems ideally situated for getting the entire Golden Gate Bridge into a single photograph. 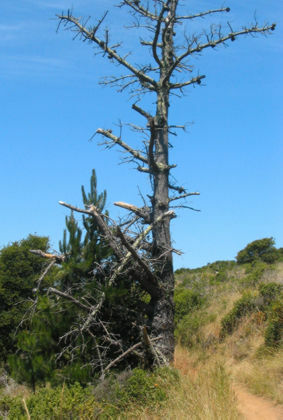 A little pine tree grows up next to an old dead one. Nature doing what it does so well. 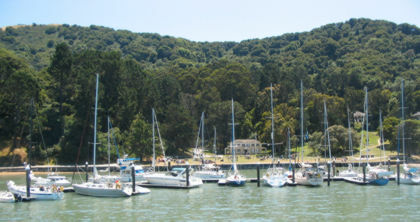 Another view of the marina at the park HQ. A floating pier down there makes this obnoxious squeaking sound that reminds me of Godzilla’s signature scream. You can’t get lost on this side of the island: just follow your ears to the sound of Tokyo being smashed by a gigantic, nuclear-powered lizard. 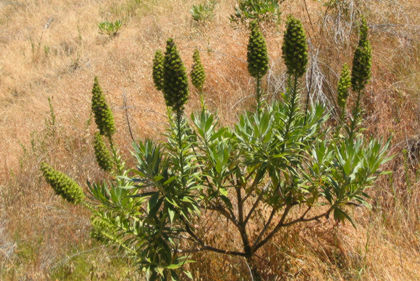 None of my wildflower pictures came out, but these shrubs managed to sit still long enough for a portrait. 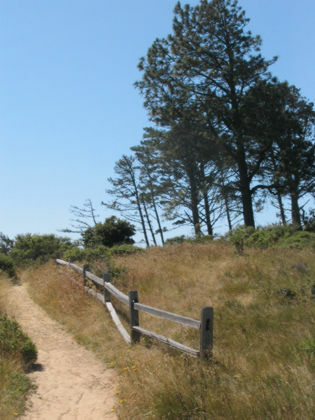 The trail comes out by this meadow full of picnic tables. 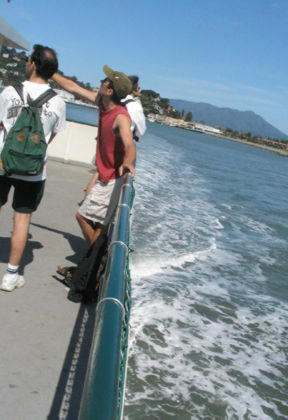 Now I’m back on the ferry back to Tiburon. The whole hike took about two hours. The boat’s wake is endlessly fascinating to a little girl. A gull has no trouble keeping pace with the boat. 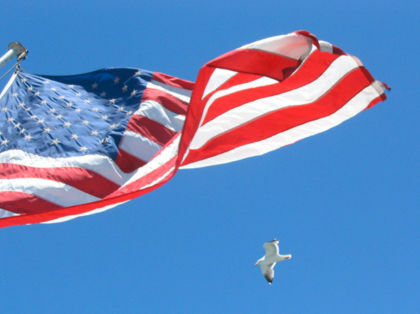 Amazes me how photogenic the U.S. flag is — hard to take a bad picture of it when the light’s right and the breeze sets it flapping. I read your slow hike/backpack request. I’m fit as all get out, but like to hike slow. As a result I’m last always or by myself.